Mahmoud Darwish is a literary rarity. Critically acclaimed as one of the most important poets in the Arabic language and beloved as the voice of his people, he is an artist demanding of his work continual transformation and a living legend whose lyrics are sung by fieldworkers and schoolchildren. Few poets have borne such disparately bestowed adulation, nor survived such dramatic vicissitudes of history and fate as Mahmoud Darwish; even fewer have done so while endeavoring to open new possibilities for poetry while assimilating one of the world's oldest literary traditions. His poetry has been enthusiastically embraced since the publication of his first volume, Leaves of Olive, in 1964. After the Arab defeat in the 1967 war, Darwish raised his voice in searing lyrics confronting the pain of everyday life for Palestinians. In a realism stripped of poetic flourish, the "poetry of resistance" was born. With Nerudian transparency, his poems of the sixties and early seventies reflected his pain over the occupation of his homeland and his lingering hopes for its liberation. 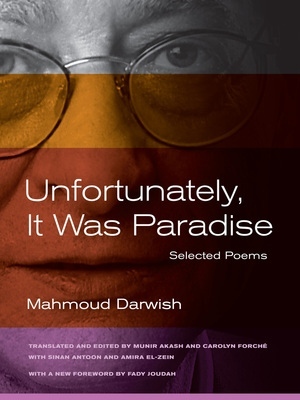 In the intervening years, the poetry of Darwish exemplified a brilliant artistic restlessness, with each volume opening new formal territory and poetic concerns. With the publication of this collection, Darwish will celebrate his sixty-first birthday and nearly four decades of writing. He is the poet laureate of Palestine—a poet sharing the fate of his people, living in a town under siege, while providing them with a language for their anguish and dreams. Any serious study of his work must take into account the context in which it was written: the years of exilic wandering and survival; the aesthetic, metaphysical, and political struggles particular to this poet. Mahmoud Darwish was born in the village of Birwe, in the district of Akka (Acre) in upper Galilee, Palestine, on March 13, 1942. When he was six years old, the Israeli Army occupied and subsequently destroyed Birwe, along with 416 other Palestinian villages. To avoid the ensuing massacres, the Darwish family fled to Lebanon. A year later, they returned to their country "illegally," and settled in the nearby village of Dayr al-Asad, but too late to be counted among the Palestinians who survived and remained within the borders of the new state. The young Darwish was now an "internal refugee," legally classified as a "present-absent alien," a species of Orwellian doublethink that the poet would later interrogate in his lyric meditation "The Owl's Night," wherein the present is "placeless, transient, absurd," and absence "mysterious," "human," and "unwanted," "going about its own preoccupations and piling up its chosen objects. Like a small jar of water," he writes, "absence breaks in me." The newly "alienated" Palestinians fell under military rule and were sent into a complex legal maze of emergency rulings. They could not travel within their homeland without permission, nor, apparently, could the eight-year-old Darwish recite a poem of lamentation at the school celebration of the second anniversary of Israel without subsequently incurring the wrath of the Israeli military governor. Thereafter he was obliged to hide whenever an Israeli officer appeared. During his school years, and until he left the country in 1970, Darwish would be imprisoned several times and frequently harassed, always for the crimes of reciting his poetry and traveling without a permit from village to village. In 1996, after twenty-six years of exile, Darwish was granted a permit to visit his family and was warmly embraced by his compatriots, the "internal refugees." Thousands of cheering Palestinians greeted him in a festive way, chanting his popular poems. Darwish later reflected on the pain and longing he felt for his homeland: "As long as my soul is alive no one can smother my feeling of nostalgia for my country which I still consider as Palestine." Darwish's twentieth book of poems, the recently published Mural, fuses lyric and epic in an impassioned meditation on the whole of his life and his own confrontation with mortality. The realized ambitions of this poem exemplify the poet's impressive range. Assimilating centuries of Arabic poetic forms and applying the chisel of modern sensibility to the richly veined ore of its literary past, Darwish subjected his art to the impress of exile and to his own demand that the work remain true to itself, independent of its critical or public reception. He has, as an artist, repeatedly confounded expectations, without shirking the role assigned to him by his peoples' historical experience. Perhaps no poet in our time has borne this weight: to be the esteemed and revered voice of a people, while remaining true to poetry itself, however hermetic and interior—to be at once culturally multiple and spiritually singular. His poetry is both the linguistic fruit of an internalized collective memory and an impassioned poetic response to his long absorption of regional and international poetic movements. As much as he is the voice of the Palestinian diaspora, he is the voice of the fragmented soul. It is the soul of Palestine that Darwish has made resonant in his work, giving it presence in the midst of suffering and hardship. Moving from city to city, exile to exile, he has written out of a distinctly Palestinian sensibility and conscience, out of the richness of Palestine's cultural past and a belief in its common destiny. At the same time, he has become a poet and citizen of the world. Darwish's poetic fraternity includes Federico García Lorca's canto hondo (deep song), Pablo Neruda's bardic epic range, Osip Mandelstam's elegiac poignancy, and Yehuda Amichai's sensitive lyric responsiveness to the contemporary history of the region. As a poet of exilic being, he resembles C. P. Cavafy, and shares with other poet-exiles of the past century a certain understanding of the exilic condition of literary art. Although his later collections became more universal in outlook, they are also a powerful outcry and statement of anguish—both of the topography of the soul and the calamity of his people. They lament the degeneration of the human condition and strive to stimulate latent forces to create a new destiny. If any particular obsession is sustained throughout his oeuvre, it would be the question of subjectivity itself, not only the mutability of identity, but its otherness. It is the spiritual dimension of what was, unfortunately, paradise, that he has most sustained in his life and work. and the sea, light; I have learned that language and metaphor are not enough to restore place to a place. . . . Not having been able to find my place on earth, I have attempted to find it in History, and History cannot be reduced to a compensation for lost geography. It is also a vantage point for shadows, for the self and the Other, apprehended in a more complex human journey. . . . Is this a simple, artistic ruse, a simple borrowing? It is our hope that this volume, and the recently published collection, The Adam of Two Edens,2 will extend his readership in the English-speaking world in this time of calamity in the poet's homeland. 1. Mahmoud Darwish, La Palestine comme métaphore Entretiens (Paris: Sindhad, Actes Sud, 1997), 25. 2. Mahmoud Darwish, The Adam of Two Edens, ed. and with introduction by Munir Akash (Syracuse: Syracuse University Press, 2000). Mahmoud Darwish (1941 - 2008) was the author of over thirty books of poems, including Memory for Forgetfulness: August, Beirut, 1982 (California, 1995), The Adam of Two Edens (2001), and Psalms (1994). He received the 2001 Prize for Cultural Freedom from the Lannan Foundation. Munir Akash is a founding editor of Jusoor, The Arab American Journal of Cultural Exchange, and coeditor of The Adam of Two Edens (2001) and Post Gibran: Anthropology of New Arab American Writing (2000). Carolyn Forché is Professor of English at George Mason University and author of The Angel of History (1994). Sinan Antoon is coeditor of Arab Studies Journal. Amira El-Zein is the author of Bedouin of Hell (1992) and The Book of Palm Trees (1973). Fady Joudah is a prize-winning poet, translator, and physician. He is the author of The Earth in the Attic (2008) and Alight (2013), and the translator of two volumes of Mahmoud Darwish’s poetry, The Butterfly’s Burden (2007) and If I Were Another (2009).